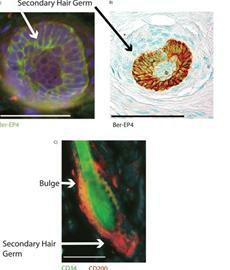 So we now know that baldness is caused by stem cells in the scalp that fail to produce progenitor cells. And so i was reading the USA today article on the recent article by Dr. Cotsarelis and his team. No, it's not a headline from The Onion ("Potential Baldness Cure Leads Man To Reverse Position On Stem-Cell Research") but researchers have found a stem cell failure may explain male baldness. So im thinking why dont we culture and clone these progenitor cells from the donor region and reinject them into the bald area? How long could this take? » to produce progenitor cells. » And so i was reading the USA today article on the recent article by Dr.
» Cotsarelis and his team. » test tubes may be lead to hair regrowth if applied as a treatment. » the donor region and reinject them into the bald area? » How long could this take? If you buy slowly reasearchers like Dr. Ken Washenik & Dr. Kurt Stenn - 10 years. But 20 years or more cant’t be excluded too, I have to add. "No, it’s not a headline from The Onion (“Potential Baldness Cure Leads Man To Reverse Position On Stem-Cell Research” ) but researchers have found a stem cell failure may explain male baldness. Brain farts or eating to much hamburgers?? Every average physician knows that every organ failure just represents the result of “a stem cell failure”! At least this part is OK. and adequately. » At least this part is OK. and adequately. "Dr George Cotsarelis who led the research said: "This implies that there is a problem in the activation of stem cells converting progenitor cells in bald scalp." Is there nobody who is able to shut off the fu… garbage media ?? » result of “a stem cell failure”! » » result of “a stem cell failure”!